Why did we read this book: Even though it’s not really our usual fare, this book sounded so good: a humane hangman based on real-life characters? Ana: I was intrigued by the premise of The Hangman’s Daughter: a historical novel set in Germany in the 17th Century with a hangman and his family as protagonists based on a real-life clan of executioners. And it starts really well with an engrossing prologue that compels the reader to feel sympathy for a hangman as he is about to go and execute someone. Unfortunately, the prologue was the highest point of this story and it all went downhill from there. The story itself, despite its extraordinary beginning proved to be a rather ordinary, banal murder mystery plot. But the novel’s greatest flaw comes from the (terrible) writing: full of out of place exposition, jarring modern slangs used in a historical context, excess of exclamation points and tedious repetition. Thea: Unfortunately, I have to concur. 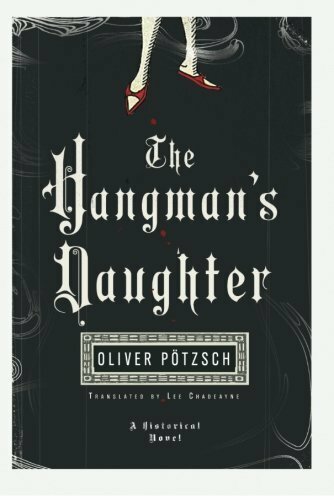 The Hangman’s Daughter has a great concept and central idea, and I loved the notion of a sympathetic executioner and torturer as he, his eldest daughter, and a young aspiring physician attempt to save the life of a wrongly accused “witch” in seventeenth century Bavaria. Beyond this conceptual gold, however, The Hangman’s Daughter fails to deliver. Over-long and riddled with anachronisms (probably in large part due to what reads like a direct translation from German), The Hangman’s Daughter did not do anything for me. Ana: 1660. The murder of a young boy puts the population of the small Bavarian town of Schongau on edge. He is found with a strange tattoo on his back, a sure sign of witchcraft and the main suspect is the local midwife. The local council determines that the woman must confess at all costs so that the case can be closed off quickly – before panic spreads leading to a possible witch-hunt. Her interrogation/torture is to be done by Jakob Kuisl, the town’s hangman who is absolutely convinced of the woman’s innocence. When a second murder takes place and two other kids disappear, Jakob, with the help of Simon, the physician’s son sets out to investigate the case and prove the midwife’s innocence before it is too late. Plot-wise The Hangman’s Daughter is quite the average murder mystery. The kids disappear, the town thinks it is the witchy midwife, our two heroes set off to investigate the case and find out who the villains are. What could have distinguished this and set it apart were the historical setting and the characters. Alas….it didn’t happen. Next to the plague, leprosy was the most dread of afflictions. Those who contacted it rotted alive – nose, ears, and fingers would drop off like decayed fruit. As the disease was highly contagious, the poor souls were usually chased out of town or had to carry bells or clappers so that people could hear them from afar and avoid them. As an expression of mercy, but also to prevent further infection, many towns built so-called leprosaria, which were ghettos outside the city walls where the sick eked out their miserable existence. It is very tell-y and not really believable if you consider that this is a contemporary character – why would he be thinking this to himself? This happens quite a lot in the story and is partly of what makes the writing so uninspired along with how some things were hammered throughout like for example: how everybody in town was so scared of the devil that they would jump at witch-hunting without thinking too much; how there was so much ambition amongst the rich and how the life for the poor was so hard. If you don’t consider the hangman’s role (which is the most fascinating aspect of the novel), everything else are unoriginal, trite, used-and-abused historical “facts” thrown in without care or examination. Am I expecting too much from a thriller? Perhaps. It was extremely jarring. And finally, toward the ending of the novel, there was a flurry of exclamation point usage – perhaps as a way to build up tension? Now, one could ask: does the translation reflect a poorly written German? Maybe, given the problems I had with other facets of the writing beyond the prose, it could well be. But I will never know and neither will be countless readers who have nothing but the English to go by. Thea: I will be slightly more charitable than Ana and place the full blame with regards to the writing style on the shoddy translation. The Hangman’s Daughter is without a doubt the second-worst translation I have ever read.1 As Ana points out emphatically above, the abuse of exclamation points, the strangely modern colloquialisms and euphemisms (the repeated reference to children as “kids” really got on my nerves) were impossible to overlook. I should note that both Ana and I are referring to ARCs which I can only assume are based on the Amazon Crossing translation, so it is possible that these glaring issues will be corrected in the rebranded print publication. However, as the translation is consistently appalling, it will take major reworking to fix. But apart from the sadly lacking linguistics, how was The Hangman’s Daughter as a story from a pure plotting perspective? The answer is…meh. On the one hand, Mr. Pötzsch does a phenomenal job and “brings to cinematic life the sights, sounds, and smells of seventeenth-century Bavaria” – it’s just that seventeenth-century Bavaria is not an entirely enchanting place to visit. The Hangman’s Daughter beautifully captures the ugliness of the time period, in which herblore and knowledge are afeared as works of the Devil, women are tortured and burned at the stake as witches in order to “keep the peace,” and folk are generally distrusting, unhygenic, and vile. I’ve never been one for romanticism of these earlier time periods, and Mr. Pötzsch painstakingly brings to life a small trading town swept by fear, paranoia, and greed. Perhaps at times the writing was a bit info-dumpy, but I was fascinated by the stomach-turning details of daily life, from the leprosy depictions, to the description of a local hangman’s duties and the status of him and his family in local village life. While the setting was superb, however, the mystery and impetus for the plot itself was not particularly groundbreaking or interesting. Perhaps this is simply because the book is too long, as there are far too many meaningless interactions between Simon (the physician’s son), Jakob (the executioner) and a slew of often unimportant tertiary characters as they search for the true culprit. When the big reveal finally happens, it’s hardly a satisfying payoff as everything is explained in a lengthy, direct dialogue fashion. And by that point, I simply did not care. Ana: At first I thought that the characters would be saving grace of The Hangman’s Daughter especially when it came to the hangman and Simon. Both came across as interesting even if slightly anachronistic figures. I liked how Jakob was this figure trapped in a family profession which he clearly did not enjoy but which he believed in. Similarly, Simon was someone who was still trying to come away from his father’s shadow and become a doctor on his own. The problem is how extreme both characters were: both being extremely good at anything they do. The hangman’s goodness and of Simon’s talent as a doctor are characteristics that are reinforced every single time either character appeared. The villains as well, were extremely villainous – complete with the Long Exposition Speech in the end. The worst thing is that there were three villains, so we got three of those. Now you must be wondering, “But how about the hangman’s daughter? She is in the title!” Well, join the club. I am still wondering that myself. The Hangman’s Daughter is quite possibly the most superfluous character in the entire novel, making appearances only now and then and I find it downright hilarious that the book is named for her. It is the biggest “gotcha” of this novel. She is also another “extreme” character: extremely beautiful, extremely intelligent, the only woman to know how to read, etc, etc. The characters were just another source of frustration when reading this novel. Thea: Yes, and yes. From a character perspective, The Hangman’s Daughter has a lot of promise, but ultimately fails to deliver. The eponymous Hangman’s Daughter is a secondary character at best – honestly, the book should be titled The Hangman or The Hangman and the Devil or something – and she is stunningly beautiful, high-spirited, and serves as a romantic foil for Simon and a plot-device to get the story moving as the book drags around the 300-page mark. The true main characters of this piece are the Hangman, Jakob Kuisl, and the budding physician (and apparently snappy dresser, for 1600s Bavaria) Simon. I liked the idea of these characters. As Ana has said before, the conceit of a sympathetic torturer and executioner is a great starting point, and Kuisl’s brand of kind brutality is, oddly, endearing. HOWEVER. Readers are hammered over the head with the fact that Kuisl is a Good Man, and can do everything from run long distances, mix masterful potions, eschew modern medical beliefs, and is otherwise incorruptibly just. It’s a bit much. Not to mention, it really bothered me that modern sensibilities were projected through these characters. For example, Kuisl ridicules “quacks” (another jarring, annoying anachronism) like Simon and his father for believing in four humors, he has a secret library with books that declare that blood is the only true “humor” and is a proponent of the power of the circulatory system. He also believes that women like the poor accused midwife are OBVIOUSLY not witches (because witches do not exist), and so on and so forth. While all this is good and right, it’s tough to swallow considering, again, this is a small town in seventeenth century Bavaria. Needless to say, the characterizations did not blow me away. Ana: Need I say more? Thea: Though it begins with a great concept and shows strong research and realization of setting and historical detail, The Hangman’s Daughter unfortunately fails as both a mystery novel and as a character study. Exacerbated by a terrible translation, I could find little to like in this novel. Notable Quotes/Parts: You can read an excerpt using Amazon’s Search Inside the Book HERE. OH THANK GOD. I got a few chapters into this and HATED IT SO HARD and put it down, to be picked up later when I was feeling more charitable. But the story was sooooooer boring and the translation was KILLING me, so I will forgo the rest with pleasure. Thank you for sparing me those hours of my life. – “What an ox he had been!” is a pretty standard, if slightly archaic exclamation in German, especially Bavarian German – I, at least, have never yet seen it used in English. Add to that the strangely anachronistic expressions, which also seems to be a typical translation pratfall (books that have been translated from English into German often suffer the same problems – in the “newer” translation of the Lord of the Rings, you can even encounter the phrase “Made in Thal” – in English, such as in Made in China! – most of these times, the original works are devoid of such linguistical missteps), and I think the translator is to blame for a lot of the problems. Still, however, I don’t think I’ll buy this novel, because the author himself also uses some tropes I dislike (the overly progressive characters in a historic society, infodumps, character that can do no wrong), which make me doubt the quality of the original German work as well. I understand the above commenters did not like the book, but I actually liked visiting the old Bavaria and thought the premise quite interesting. Is anyone really writing books about the old executioners – I really found it intriguing and really “saw” how they might have lived back then. Carol says: I liked the book. Yes, I knew there were problems with the translation, but the descriptions of Bavarian life in the 17th century, plus the hangman actually being related to the author all made it fascinating to me. It was a bit overlong, however, but I was glued to the book to the end. Thank you. This came up as a 99 cent Kindle option for me this morning. Although the author has my sympathy if it’s due to a shoddy translation. I agree with the confusing grammar and strange translations, but I thought the overall story was fun. I love historical fiction and the fact that the author came from a family of executioners made the book appeal to me even more. Based on your rating system, I’d give it a 5… MAYBE 5.5. I purchased it on my Kindle when the book was $1 so I’m not regretting the buy. And I have to disclose that I haven’t really been reading it. I set the book on “text to speech” mode so I could listen to a robotic woman’s voice tell me a story while I did laundry or organized papers. I didn’t dwell on how the modern slang or the inconsistent language kept popping up or how perfect the main 3 characters were; it was a great way to pass the time and reminded me of something my creative 9-year-old self would have thought up. And I liked it enough to give the other 2 books a shot (at $1 apiece). What is the symbol in the book for Hematite. . It sounds like an ankh.